Cheese is my weakness. I will never pass up the opportunity to eat or cook with cheese. 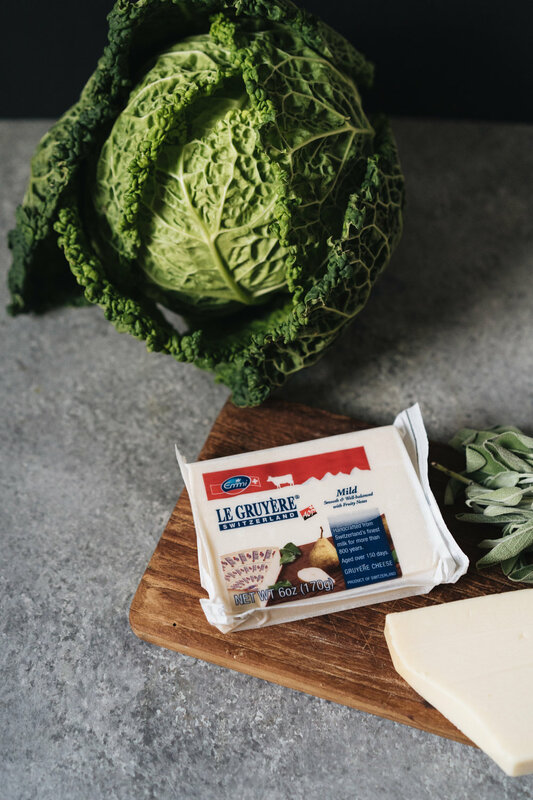 So, it was a delight and pleasure to develop this recipe in partnership with Emmi Cheese - a show-stopping new roasted cabbage dish using their spectacular Le Gruyere AOP cheese. 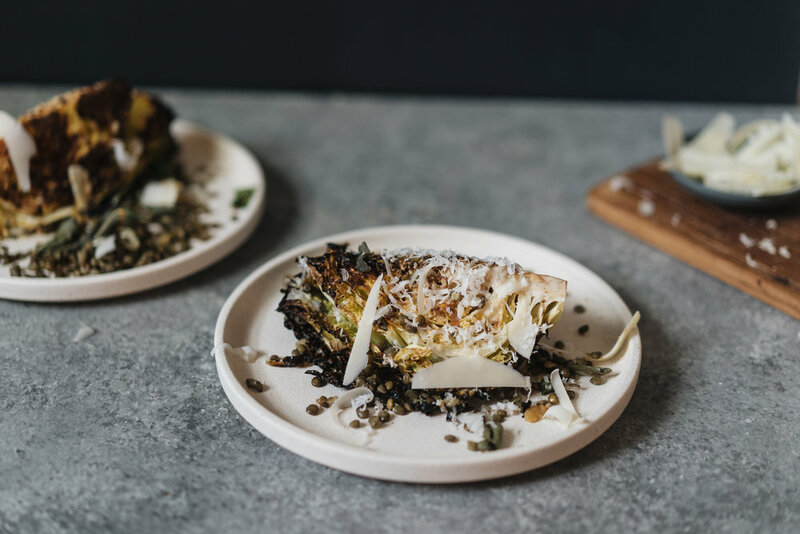 This dish is perfect for entertaining and is rather irresistible – roasting the cabbage (you can use savoy, purple or green) at a high temperature brings out the sweetness, while the coating of gruyere cheese adds such an enticing umami note. The brown butter, crispy sage, lentils and walnuts – plus more gruyere- provide a perfect earthy, nutty backdrop. This is cabbage as you’ve never eaten it before. Emmi Le Gruyere is smooth and super nutty, and I love to have some on hand for cheeseboards (which I often have for dinner); during fridge raids when I’m in urgent need of a nibble, finding a block of gruyere is like striking gold. One of my favorite snacks is a sliver of gruyere topped with a slice of pear, persimmon or medjool dates. Apart from their delicious cheese, I also love the story of Emmi’s commitment to sustainable and traditional agricultural practices. Emmi cheese is made in Switzerland, where cheesemaking is an art form – cheesemakers and farmers work together, respecting the traditions of the people, the land and animals. The use of GMO feed is strictly prohibited, and they have stringent animal welfare regulations. Le Gruyere cheese dates back to the 12thcentury and the same heirloom recipes and techniques are used today. Farmers feed their cows a naturally sustainable diet of pasture grass in the summer and hay in winter. Copper vats are used to impart a complex character to the cheese. In the mood for gruyere? Find Emmi Le Gruyere here. This recipe is a keeper for the holiday season. Enjoy. Preheat oven to 450˚F (230˚C). Cut the cabbage into 6 wedges. 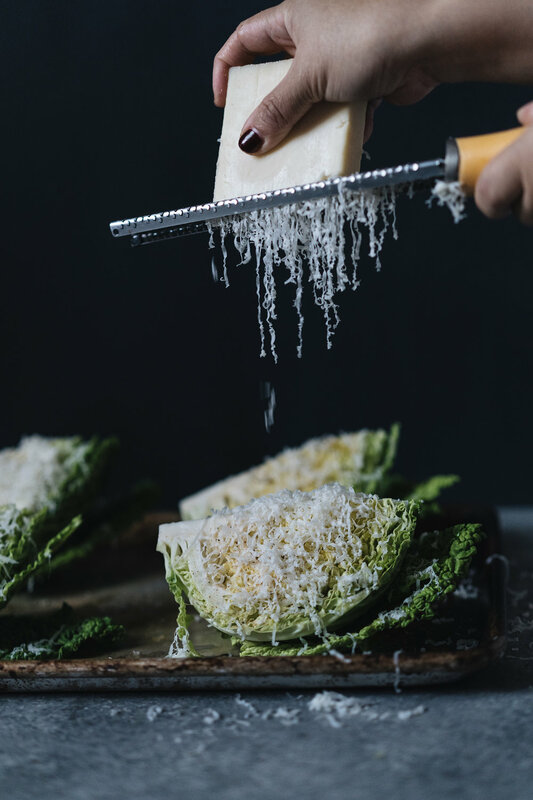 Place the cabbage wedges upright (cut sides up) on an oiled baking tray and drizzle with olive oil, a pinch of nutmeg, and season with sea salt and black pepper. Grate a generous amount of Le Gruyere AOP cheese over each wedge, until it’s well covered. Roast for 10-12 minutes, until turning golden. Remove the tray from the oven and add the shallots to the tray; turn all the cabbage wedges over and roast for a further 10-15 minutes until golden on the outside, and tender on the inside. Bring a pot of salted water to the boil and add the lentils. Cover and cook for about 20 minutes, until the lentils are just tender. In a frypan on medium heat, melt the butter. Once the butter starts to foam, add the sage leaves, lower heat slightly and cook for 2-3 minutes until the butter is browned and the sage is crispy. Remove from heat, take the crispy sage out of the browned butter and set aside. To serve, spoon the lentils onto a large serving plate. 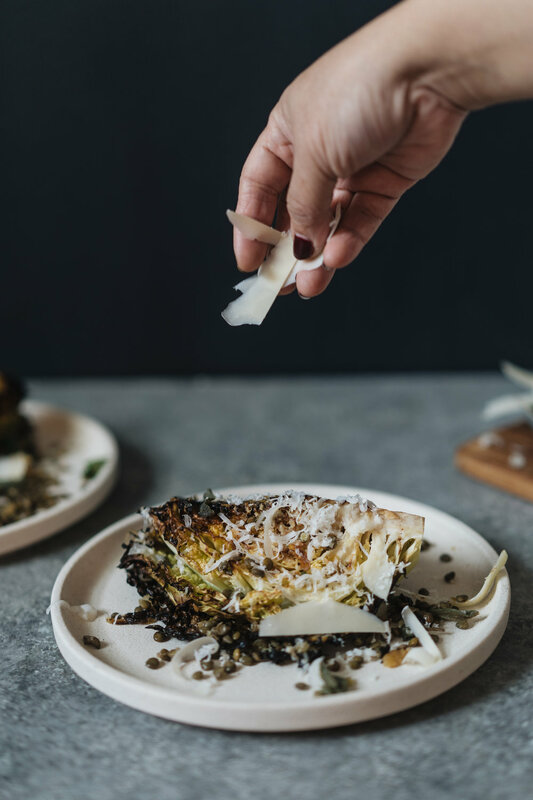 Top with the roasted cabbage, shallots, season with sea salt and black pepper, and drizzle over the brown butter. Scatter with crispy sage, walnuts and parsley, and finish by adding shaved or grated (or both) gruyere cheese. This blog post was sponsored by Emmi USA but all opinions and thoughts are my own. I only work with products that I genuinely eat and adore, and I always endeavor to partner with companies which value community and family. I am honored to work with Emmi to bring this new recipe to my website.